Pearl Jam's "Official" bootleg albums are a large and continually growing series of live-in-concert discs that the band began producing to provide a more-affordable and better-quality product than the illicit "black market" albums being sold to their fans. The band has reportedly sold more than 3.5 million copies of the various shows since launching the bootleg project in 2000. 14 5/30/06, MCI Center, Washington, D.C.
8 6/22/08, Verizon Center, Washington, D.C. THE AMERICAN FOLK MUSIC boom of the 1950s gained even more momentum as the 1960s dawned. Young new groups formed all across the land, and the Northwest saw its fair share of spirited kids singing and recording traditional tunes. Among those scoring notable recording deals were The Group (Golden Crest Records) from Olympia, the Brothers Four (Columbia Records) from Seattle, the Chad Mitchell Trio (Colpix, and Kapp Records) from Spokane, and the Travelers 3 (Elektra Records) from Eugene, Oregon. 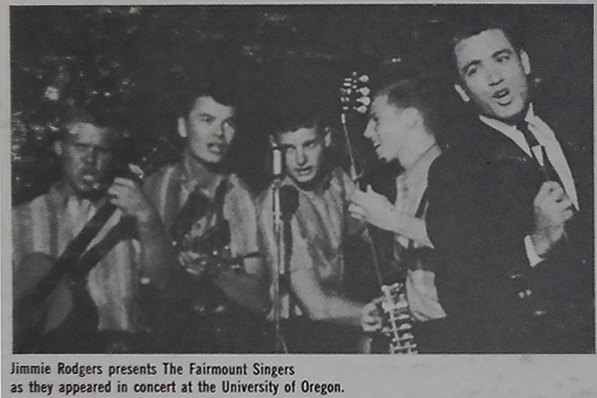 Then there was the Fairmont Singers who originally formed as high schoolers, and having been inspired by hometown heroes, the Travelers 3, they carried on into their college years at Eugene’s University of Oregon. 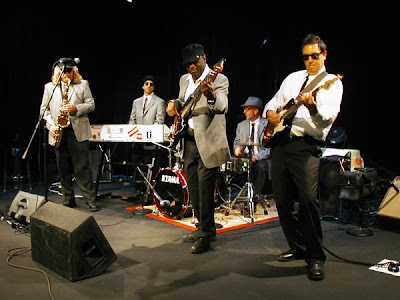 The band’s lineup solidified as: Dave Ellington (vocals, guitar), Hal Ayotte (tenor vocals, tenor guitar), Terry Tillman (banjo), & Rob Mills (vocals, bass). In the summer of ’61 they scored a two-week gig at the famous Ice House folk club in Pasadena, California, where they struck a chord with the discerning audiences and their contract was extended to a whole month. During that time one of the most successful late-‘50s folk/pop pioneers, Jimmie Rodgers (of Camas, Washington) – whose tunes like 1957’s “Honeycomb” and “Kisses Sweeter Than Wine” had became international hits – discovered, and then began mentoring the group. 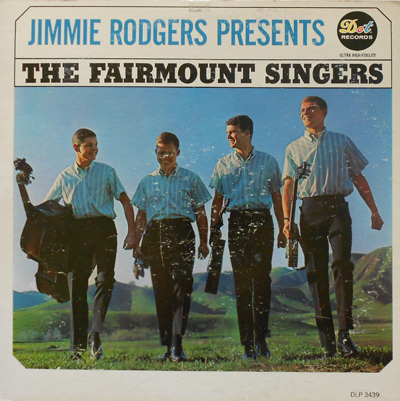 The Fairmont Singers were suddenly opening concerts and nightclub gigs for Rodgers, including a home-coming show on April 28, 1962 – the Folk Music ’62 event at UO’s Mac Court venue (with a concert at 7:30 pm, and a dance at 9:30 pm). 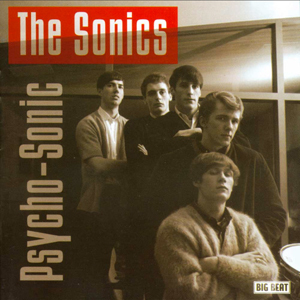 THE SONICS WERE THE UNHOLY PRACTIONERS of punk rock long before anyone knew what to call it. But that's not to say that certain parents in the Pacific Northwest didn't try to come up with a few choice words for the band and their primitive and brutally raucous sound. Originally cut in 1964 and '65 the recordings offered here represent nothing less than some of the very rawest and most savage rock music yet achieved by mankind. The Sonics aggressive aural attack was due in equal measure to the perfectly chaotic lead guitar spasms of Larry Parypa, the murderous screams that serve as vocal lines as patented by Gerry Roslie, the frenzied propulsion generated by Rob Lynn (sax) and Andy Parypa (bass) and the absolutely atomic tub thumping of Bob "Boom Boom" Bennett. These five bad-boys were strictly lewd, rude and crude. Not only did the Sonics come up with killer riffs on a regular basis but their song's lyrical content relentlessly explored the full range of topics from satanic threats ("He's Waitin’"), to evil chicks ("The Witch"), to the joys of overdosing on toxic substances ("Strychnine") to disturbing mental states ("Psycho"). And all this in the name of fun. The Sonics helped fuel a vibrant teen dance scene that also included other such notable Northwest combos as the Frantics, the Kingsmen, Paul Revere & the Raiders, the Ventures, Don & the Goodtimes, the Viceroys, the Counts, the Dynamics, and of course the one band that overshadowed virtually all of them - the Fabulous Wailers. Inspired by the Wailers' success, the Sonics formed in 1963 on the north side of Tacoma, Washington, in the heart of Boeing country. "We got our name from the sonic boom made by the jets," Andy once recalled. "It seemed natural." Although they maintained the standard 5-piece lineup (sax, keys, guitar, bass, drums) and they did share with many other local bands a common core of the Northwest standards in their repertoire, the Sonics simply transcended any possible limitations erupting with a tough and unprecedented new sound. It took a good year for the Sonics reputation to take hold, but then came the day when the Wailers' bassist, Buck Ormsby, out scouting for talent for their label happened to cross paths with our boys. "They were practicing in Bob Bennett's basement," Ormsby recalled in 1985. "I was looking for something that was different, something that would rock my socks off. I went down and saw them, and I found it. I liked the guitar because it sounded dirty, and I liked Gerry because he was such a screamer." 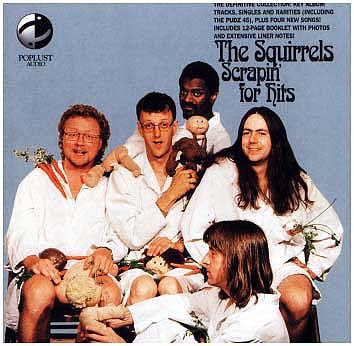 As producer, and co-producer with Kent Morrill, Ormsby's greatest challenge was to capture on tape, by whatever means necessary, the raw power and sinister essence of ths unique quintet. And he didn't give a damn what it took to accomplish this. In this quest they must have irked the poor studio staff to no end. The band members began by tearing down half the egg cartons that lined the ceiling and walls in one studio, "to get a liver sound." They then proceeded to push every piece of the studio's ancient gear well past reasonable limits. 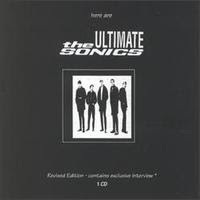 By redlining the deck's VU meters and overloading every tube in every old amp in the place the Sonics found their sound. "We had a hell of a time with the engineers," says Ormsby. "They just weren't used to the full energy stuff. You have to remember that the state of the recording industry in 1964 was something less than crude. We kept saying we wanted to do this or that and they kept saying you can't do that. We didn't care if it bled - I wanted to hear sweat dripping on the tape." Hey, it bled. It sweated. And it was the most gloriously primitive din you were ever lucky enuff to hear on your transistor radio. That first single, The Witch, charted within weeks on a few brave but minor local radio stations, but not on KJR the region's dominant Top-40 giant. Led by DJ Pat O'Day the station was clearly ignoring the single. Kids kept requesting "The Witch", so Pat started playing it on KJR and the place went nuts". Charting on KJR's fabulous 50 gave it a real boost and before long "The Witch" was breaking out in scattered radio markets including Orlando, Pittsburg, upstate New York, and San Francisco. "The Witch" became the all time best selling local rock single in Northwest history. Andy once revealed, "O'Day later told me that eventually the song had reached #1 in sales, but the station policy said it was too far-out to chart at #1." The station only played it after kids got out of school because of the station management's fears of alienating the housewives that comprised KJR's daytime audience. In '66 the Sonics signed with Seattle's Jerden label which released a handful of uneven recordings that received national distribution through ABC Records, but regrettably they just never did score that one big international smash hit. But then, their’s was a specialty market, a finite potential audience, perhaps an acquired taste. 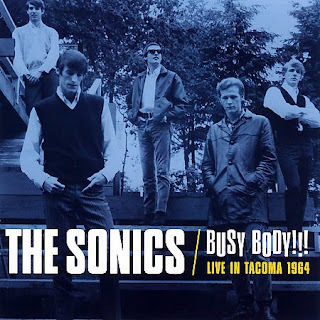 The Sonics remained a top draw at local dances right into 1967 when they broke their last sound barrier and folded. 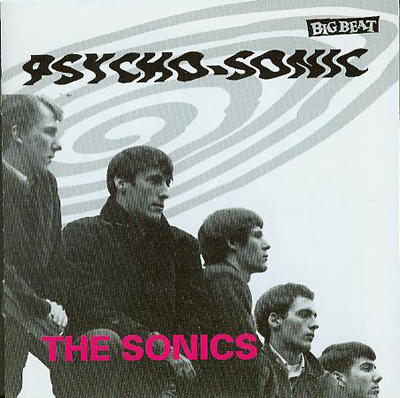 The Sonics will forever be revered for their solid proto-punk contributions to the sixties. They rocked like bastards and one imagines to this day that their name alone might send high school principals and small town police chiefs running for cover. 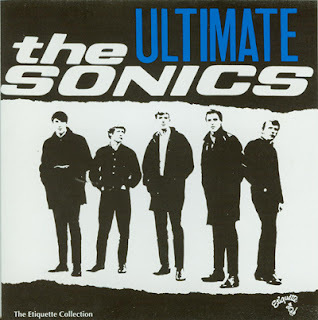 Three chords, two tracks, and one hell of a band: THE SONICS! AT EASE TROOPS: Resting in your hands is the first volume of Ace Records’ mighty Battle of the Bands compilation sets of prime vintage rock ‘n’ roll from the Pacific Northwest. And though this CD series is new, the tradition that it is named for dates well back in time and was, for example, already established in the jazz world at least as far back as the Roaring ‘20s. Needless-to-say, of course, decades later when some rock ‘n’ rollers got ahold of the idea, the stakes were raised considerably. 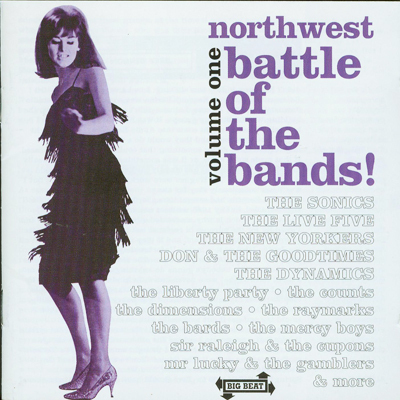 Regional Band Championships, in which legions of local bands battled for supremacy, were first promoted as part of Seattle’s (and then Portland’s and Spokane’s) Teen Fair events in the mid-‘60s. The strategic objective for young musicians – other than a chance at winning the attentions of girls – was to capture some of the array of spoils being offered, chief among them being a genuine recording contract with the happenin’ local label that had recently launched the Kingsmen’s infamous “Louie Louie” 45 from the Northwest into an international phenomenon.Indeed, this entire Ace Records CD series is based on the prodigious output of Jerry Dennon’s Seattle-based Jerden family (e.g. Panorama, Piccadilly) of labels – a consortium that released many additional radio hits and contributed more than any other firm in the promotion of Northwest rock. It seems worthwhile to ponder for a moment here the notion that a staged musical skirmish’s ultimate purpose is probably similar to that of certain competitive sports, that is, as one of modern culture’s ritualized forms of warfare – a way to blow off steam. But even though bloodshed and wanton pillaging have been relatively rare at such rock ‘n’ roll rumbles, the battles have not all been without consequence. 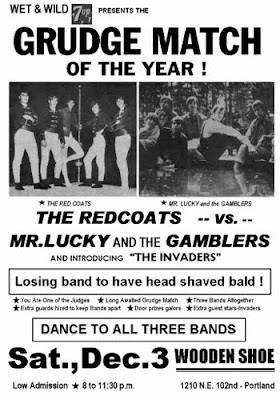 One extreme example is documented by a notorious mid-‘60’s “Grudge Match” poster (Mr. Lucky & the Gamblers vs. the Redcoats) which proclaimed that the losing local band would suffer what was undoubtedly then considered to be the most horrendous punishment imaginable: the public shaving of their heads! Wow -- wasn’t that outlawed by the Geneva Convention? Witnesses recall that competition among the scores of teen combos engaged in the ‘65 Battle was particularly fierce – Hey! Tell the truth: How would you, tenderfoot, like to have had to square off against such battle-hardened vets as the Sonics, Live Five, Bandits, Dynamics, Liberty Party, Counts, Bards, Dimensions, City Limits, Mercy Boys, Don & the Goodtimes, George Washington & the Cherrybombs, and Mr. Lucky & the Gamblers? – but, when the drums were stilled, the dust settled, and the smoke had finally cleared, the first Battle of the Bands! compilation LP honored the victorious combatants. Similarly, the ’66 battle rewarded the top-ranked combos (the Kingsmen, Sonics, Bards, Live Five, Magic Fern, Brave New World, London Taxi, Bumps, Springfield Rifle, Breakers, PH Phactor Jug Band, Don & the Goodtimes, and the Rock Collection) with inclusion on the second Battle of the Bands! volume. The champion band that year was Seattle’s Jack Horner & the Famous Plums who also scored both an old-fashioned trophy and a then-cutting-edge electric 12-string guitar before slipping into obscurity. Because Dennon’s labels documented this region’s musical evolution from the earliest original “Northwest Sound” instrumental years, up through the garage rock heyday and well into the psychedelic sixties era, his Master Tape vaults are still capable of providing significant surprises. And so, Ace is proudly able to offer here, for the first time anywhere, a good number of previously unissued discoveries that offer ten-megaton proof of the power of one region’s take-no-prisoners rock ‘n’ roll traditions…and a sound that continues to storm the barricades and conquer hearts around the world.